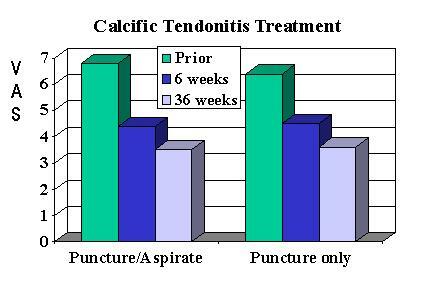 Calcification seen in the Supraspinatus tendon with tendonitis is by tradition treated by puncture and aspiration of the calcific deposits. I never met anyone who did it. Now, it appears just puncturing the deposit and steroid injection into the deposit is enough to ensure long term benefit. When the patient lifts the arm up to a certain point, an exaggerated painful arc occurs (seen as well with plain tendonitis), as this fragment slips under the the impinging acromium(roof subacromially). This was followed by “At least 1 mL suspension (25 mg hydrocortisone acetate and 1% lidocaine hydrochloride) was injected into lesion and subdeltoid bursa”. Comment – None of these cases had tears – just “thinning”. My protocol for these is to inject them once with Kenalog, and follow that up with work on muscles and deep frictions to tendon. needling to deltoid – interestingly, I had a case that would spectaularly catch on arm raising but once the deltoid was needled and the muscle relaxed, the acromial roof impingement temporarily abated – showing the role of deltoid tightness in the impingement. Massaging out the subscapularis – I have never been able to do this under 120 transverse rubs so anyone who just does a few is kidding themselves. Cyriax style painful transverse frictions -15 minutes at a time. I had a case of calcific tendonitis I did not inject but just transversed frictioned – she had a followup xray that showed deminution in size to the calcification which I attributed to the transverse deep fricition. I do them myself because I can’t get anyone else to do them. A few get better quite rapidly, but for some, they are not the answer by themselves but work in combination with other measures. Pingback: Pain Medical Musing » Blog Archive » Shoulder Pain Patient Needs Help - Any Suggestions?